I hope you enjoy my jeans, running shorts, dress shirt, tan sock, and black sock. I hope you're wearing them when you are met with karma. P.S. 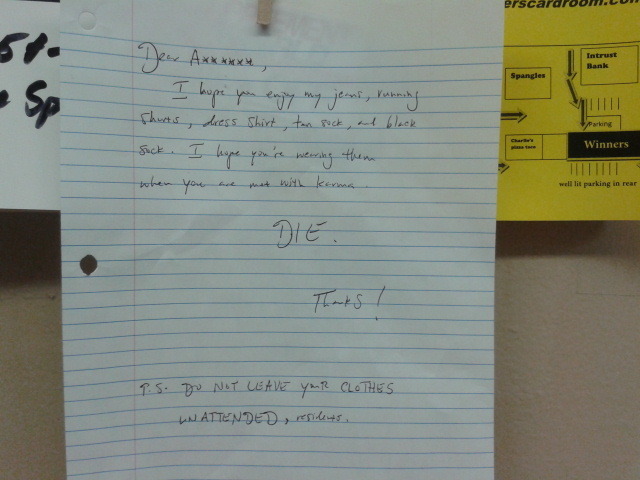 DO NOT LEAVE YOUR CLOTHES UNATTENDED, residents. Now I don't know about anyone else but we always sit on the nice comfortable couch that is provided down there and wait for our laundry to be done rather than just leave it. Obviously we are in the minority since we always see other loads running down there but never anyone else hanging around. What we find even funnier about all of this is the randomness of the taken items. It makes me think that these items were not taken but accidentally left behind or never brought to the wash in the first place. Especially after we found what seemed to be a pair of spandex shorts and a black sock left in one of the machines. I just hope this person learned their lesson and doesn't leave their stuff unattended but I highly doubt it.